The Dangers Of Halloween And Tips On Keeping Your Family Safe - Advice From Dallas Personal Injury Lawyer The excitement is building up with Halloween right around the corner. Here are some safety tips to keep your family safe during this frightening night. What Is Involved In A Personal Injury Case? Dallas, Texas Personal Injury Attorney Explains At The Button Law Firm, we want to help everyone get informed. Do you want to know what is involved in a personal injury case? Read this. 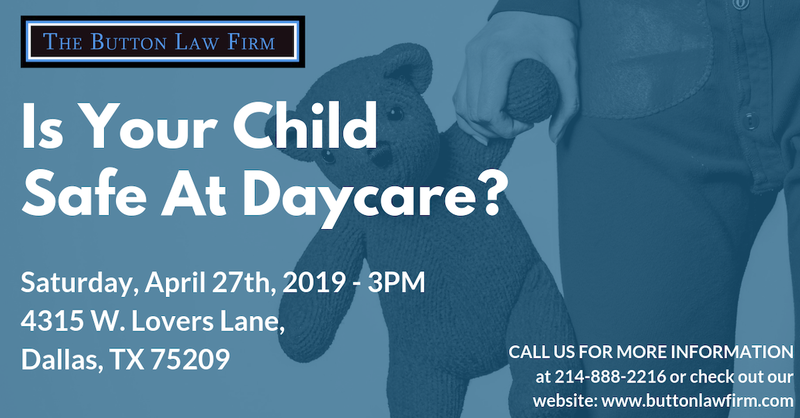 Why Choose The Button Law Firm The Button Law Firm Serves North Dallas, Midland and Odessa as well as Houston and Southern Texas! How Does A Settlement Work? You want to settle the case but don't know what that means. Read our free information and request my free book to learn more. What Is The Difference Between A Settlement And A Verdict? I don't know what a settlement or verdict is. How do I find out? Read this and more. When Should I Speak To An Attorney? Don't know what to do but don't want to speak to an attorney. Learn about when you should speak with a lawyer and more. How Do Bars Contribute to Drunk Driving Wrecks? Sometimes alcohol serving facilities contribute to drunk driving wrecks in the United States. We're here to tell you how. How A Personal Injury Attorney Contingency Fee Works? Read this article if you want to learn how personal injury attorney like us get paid in cases like yours. It is not what you think. How To Pick The Best Lawyer For Your Injury Case? When you don't know where to turn or what to ask? Read this article on how to find the best lawyer for your injury case.